Q: How do I know if my piano needs tuning? How often should it be done? A: Pianos go out of tune more quickly when they are new because the strings are stretching more. They go out of tune due to variations in humidity and temperature. 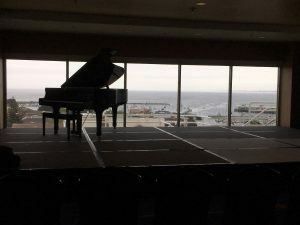 The California climate is generally less severe on pianos than the “Four Season” states, so tunings are usually done once or twice a year, half the recommended amount in those cold/dry/hot/humid areas. If your piano hasn’t been tuned for a year or more, it is time. If you wait until it sounds bad, it is usually due for a remedial pitch raise, not just a tuning. Think about delaying dental work and you get the idea! Q: How much does a piano tuning cost? Do you offer discounts? A: If the piano is in good condition and has been tuned in the past year or so, I typically charge $175 for a normal service, which includes tuning, interior cleaning, tightening bench legs, adjusting the pedals, and minor adjustments. If it has been many years, the overall pitch of the piano may have changed so much that a “pitch adjustment” may be necessary at extra cost. If significant repairs are needed, I will certainly discuss the cost before starting work. Fine pianos require regular regulating and voicing every few years in addition to tuning service. I offer a 10% discount for service calls involving two or more pianos at the same location. I do not offer “neighbor” discounts: it gets too complicated. If I make an emergency call or have to travel far outside my normal region, an additional charge will be made. Q: What do you need from me when you tune the piano? A: I need relative peace and quiet, since I will be working for an hour or so intently listening to the sounds from your piano. It may seem a bit noisy as I play notes loudly over and over again, so you may want to find somewhere else to go in your home while I’m there! The washer and dryer, noisy TVs, clanking dishes, playing kids, and barking dogs make my job more difficult. I’m kid friendly (I raised three of my own), but I generally don’t need their “help” while I’m working. I’m happy to give a brief demonstration of how the piano works, though. Most people get bored after five minutes watching me tune. If you have an extensive collection of knick knacks and breakables on your piano, I appreciate your assistance in having these removed ahead of time. The piano generally does not need to be moved away from the wall for tuning. I do need a reasonable amount of room to work at the front of the piano, and good lighting is appreciated too. A: Unlike dentists and electricians, there are no required certifications for piano technicians. If you want your piano to be serviced properly, choose someone who is a Registered Piano Technician member of the PTG, who has earned the trust and respect of professional teachers, schools, and musicians for a long time. Paying a second time to have the same work redone demonstrates that the cheapest price isn’t necessarily the most economical. This is a specialized service requiring technical competence, musical understanding, and solid business integrity. Q: What is the PTG (Piano Technicians Guild)? Q: What kind of pianos do you work on? A: I work primarily on good quality grand pianos. I do have a variety of instruments in my care, including some very old uprights and not so nice spinets. The most expensive instruments I care for cost as much as a small home, while the lowliest ones are sometimes rescued from the Last Chance Store at the dump in Marina. I treat each one with respect, since an aspiring student may be developing a promising future on the most humble of instruments. Many of my customers with good quality pianos started out with lessor instruments, and I am glad to have been there since the beginning. I do not work on old “Square Grand Pianos”, desk shaped antiques that hurt my back after tuning because I have to bend over so far in the process. I do not consider myself a “Player Piano Technician”, although I can tune them. The old pump type, paper roll players are a complete specialty unto themselves. I do have certification on the newer Yamaha Disklavier electronic player pianos. I do not install the competing systems, and much prefer the Yamaha factory system to the two competitors. Q: What areas will you travel to? A: I spend 80% of my time working in the Monterey Peninsula area. I generally stay in Monterey and San Benito County, and will travel as far as Big Sur, King City, and Hollister. I try to schedule several appointments before travelling to those areas. I usually recommend other technicians for more distant areas. Q: Do you evaluate or appraise pianos? Valuation for IRS tax purposes now require a “certified appraiser” to make the report. I can assist in connecting you with a qualified professional and making the required inspection.